I get it, I do: You’re a fan of basketball, and this weekend has given you not one but two Final Fours watch. A choice appears. In one corner, an 11-seed underdog that might just do the dang thing and three high seeds that survived historically weird brackets; in the other, four No. 1 seeds, led by the same No. 1 seed that’s kicked everyone’s teeth in more or less since the Big Bang. It seems like a no-brainer. This is the part where I ask you to Hear Me Out. There’s not much I can say that would or should convince you to bet against UConn—the Huskies are pretty damn great. Their loss to Mississippi State last year was fantastic, but let’s ground ourselves in the facts: The Huskies reeled off 111 wins leading up to Morgan William’s buzzer-beater, and they’ve compiled 36 wins and exactly zero losses since. They are still UConn. So where does that leave women’s basketball fans heading into the most important weekend of the year? In the perfect spot, actually. Is There Any Way UConn Blows This? For a moment, let’s set aside UConn, and by relation, Notre Dame. They’ve played each other 47 times before and the Huskies tend to dominate that matchup, albeit not in the NCAA tournament, where their head-to-head record is knotted at 3-3. In men’s basketball terms, this game is Duke-Kentucky, essentially. But even though this should be a stellar game, the other side of the bracket deserves your attention. Mississippi State is there, and they look as dominant as any non-UConn team and as ready as they could possibly be to avenge last year’s title-game loss to South Carolina. To get that shot they’ll need to stop a top-seeded Louisville squad, which has routed top-five teams all year long and already beaten Notre Dame twice this season. Neither program had ever been a No. 1 seed in the NCAA tournament before this year, but they’ve both got plenty of tournament experience on their rosters. Durr’s main offensive relief comes from senior forward Myisha Hines-Allen, who functions as the team’s interior terror—she averages 14.1 points, 9.7 rebounds, and 2.2 assists per game. Jazzmine Jones, a sophomore guard, is the team’s energetic; while redshirt junior guard Arica Carter balances the team out defensively, routinely lining up against the opposing team’s top guard. Mississippi State, for its part, is a fantastically fun team to watch, thanks in large part to McCowan, who is one of the best centers in the game. We’ve covered McCowan’s greatness and the Bulldogs’ general rise to power before, but it’s worth noting once again that the junior is the real deal. She’s a terror inside on both sides of the floor—as a colleague put it yesterday, “Andre Drummond with a slightly better free throw percentage.” McCowan pairs with guard Victoria Vivians, the team’s leading scorer, to provide one of the best inside-out punches this side of... well, Durr and Hines-Allen. The Bulldogs, like Louisville, have their star, and then they have their game-changing defense. Mississippi State forces turnovers on just a shade under a quarter of a team’s total possessions, helping it hold teams to 55.6 points per game this season. That’s to say we’re either in for a 98-97 thriller, or a 56-49 grindfest. Either of those should be worth watching, although I won’t pretend to know which one we’ll get. 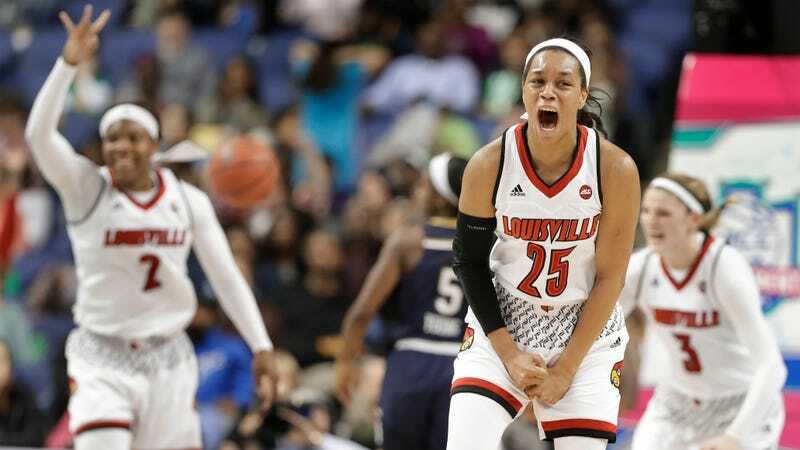 Stepping back from just the sport of women’s basketball, Mississippi State’s had Louisville’s number this year, as the Bulldogs escorted both the Cardinals’ men’s basketball and football teams into the offseason, besting them in their bowl game and knocking them out of the NIT (heh). Not that either side needs more motivation, but I’m pretty Louisville will officially become the new Kentucky satellite campus for Mississippi State if it loses this one, too. It’s a small blessing that the seeding worked such that Notre Dame and UConn will face each other before the national title game—knowing that at least one of the two biggest upstart programs in the women’s game will have a shot at the title is gratifying, and either would match up much better with UConn than Notre Dame. Also, we have already watched the Huskies and Fighting Irish play each other in the national title game in 2014. And in 2015. The Fighting Irish won their Final Four matchups over UConn in 2001, 2011, and 2012—they claimed the 2001 title, their only one to date. More recently, the Huskies disposed of Notre Dame in the semifinals in 2013, and then again the next two years in the title game. I think we get it, at this point—they’re both really dang good, but only UConn has been able to go all the way more than once. This isn’t to take anything away from the Fighting Irish, who are an exceptional team, but as Durr and Louisville exposed in January and March, they’re susceptible to teams that can drown you in three-pointers, mainly because they don’t always make a ton themselves. In a 10-point win over Oregon in the Elite Eight, Notre Dame managed just three long balls all evening; UConn drained 12 against South Carolina. It doesn’t help that Notre Dame is also down an astonishing four players due to ACL injuries—that the team managed to secure a No. 1 seed is an amazing feat just by itself, and one for which head coach Muffet McGraw was rightfully awarded the AP coach of the year award on Thursday. That being said—and I would be delighted to get mocked for the rest of my life for getting this wrong—I don’t see this team getting past an absolutely stacked UConn team, not in this reality. So the question then becomes: Who, between Mississippi State and Louisville, will provide college basketball fans the best opportunity at seeing the mighty Huskies walk off the court in shock, as happened last year. It genuinely seems like a toss-up. Both teams have dominant centerpiece stars (McCowan and Durr) and solid No. 2 players (Hines-Allen and Vivians) that balance them out offensively; both also rock top-five defenses that just might be disruptive and fluid enough to slow down a Huskies team that rolls out five stars at every position. The Cardinals might have the slight advantage, if only because Hines-Allen and Fuehring are a pair of fleet-footed interior defenders, opposed to McCowan, who functions as more of a traditional shot-blocking five. Given that UConn likes to spread four players around the arc—three of them shoot better than 44 percent from long range—and stick someone at the free throw line to open its sets, having quicker and longer defenders could help the Louisville defense on ball screens and keep them out of foul trouble. Then again, McCowan’s the only one that can say she’s actually beaten the Huskies before. All the talk of UConn’s dominance can be draining, but it’s worth remembering that, at least with this year’s team, they’re not unbeatable, and nowhere near inevitable regardless of which team they’ll face on Sunday. As Morgan William proved last year, you don’t need to be better than UConn for a full 40 minutes to beat them—that’s just not going to happen. All you need is to let your best players cook and keep them within striking distance; once that shot clock turns off, everybody’s mortal and anything is possible.